Struggling to find the time (or the will) to exercise? It’s all about making that start, so put on your brightly coloured workout gear and witness the fitness! You’ll end up feeling more energised and the bonus endorphins will boost your mood. Fitness and lifestyle expert, Lisa Raleigh gave us a few tips. * Get some sleep! Enough sleep can help regulate your weight. Inadequate sleep increases cortisol levels and increases ghrelin – the peptide that stimulates hunger. It also reduces leptin, a hormone that signals fullness, leaving you hungry and more likely to store fat. * Give spot training the boot. Working one area won’t eliminate fat from it, and overdeveloping one muscle will create a body imbalance. Your workout should have cardio, strength and flexibility components; only then should you target specific areas. * Dry brushing is your secret weapon against cellulite. Using a firm, horsehair brush, work from your feet up, sweeping over the body with firm strokes. Always move in the direction of your heart and go easy on sensitive areas like your neck and chest. Dry brushing helps shed dead skin cells, improves skin texture and promotes cell renewal. It also increases your circulation and helps with the lymphatic drainage of the entire body. * Hit the trampoline! Rebounding is an amazing way to boost your energy levels, get your heart pumping and burn kilojoules – whilst sparing your joints any hard impact. * Shake up a steady-state cardio routine with interval training. Bursts of one-minute sprints followed by three-minute recoveries help you burn fat rather than carbohydrates – your precious energy supplies. These varied and explosive movements stimulate your body’s repair cycle effectively for higher kilojoule burns and improved fitness. If you have limited time, HIIT is your BFF. * Cleanse your body and go on a detox. It will help you get rid of toxins, stimulate your digestion and improve energy levels. * Keep it interesting. The same routine delivers the same results. You need to vary your programme often to challenge your body and prevent boredom, and also to stave off weight-loss plateaus. * Push the weights. 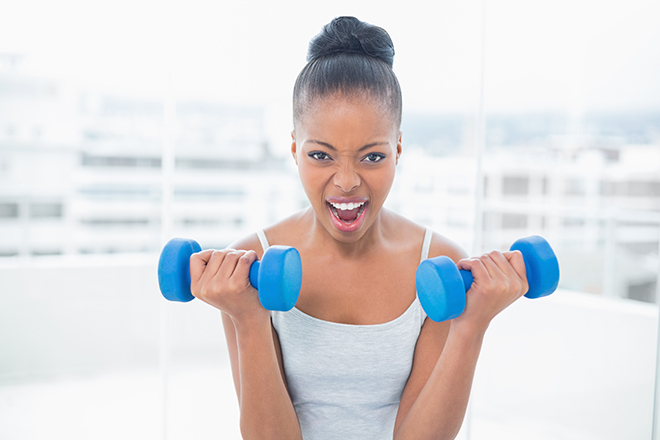 Strength training is critical for long-term toning and health benefits. Compound movements in particular are responsible for greater kilojoule burns during sessions as well as increasing lean muscle tissue at a greater rate, meaning a faster metabolism overall. * Have a goal in mind: if you are dragging your feet when it comes to working out, visual motivation will get you going. Keep photos of you at your fittest in your office; picture fitting into your dream swimsuit, last year’s skinny jeans that doesn’t quite fit anymore; or look for pictures that match realistic goals of your ultimate body. You can do do it – and we’ll join you! Share your fitness tips and favourite exercises in the comments section below. The bus stop is far from work so that’s my daily workout, lol! High Intensity Interval Training is one of the best ways to exercise especially if you don’t have time. If you are really running late and missing your workout…try dancing while you’re cooking, its fun. That is a great tip to change routine many of us try and keep it the same.